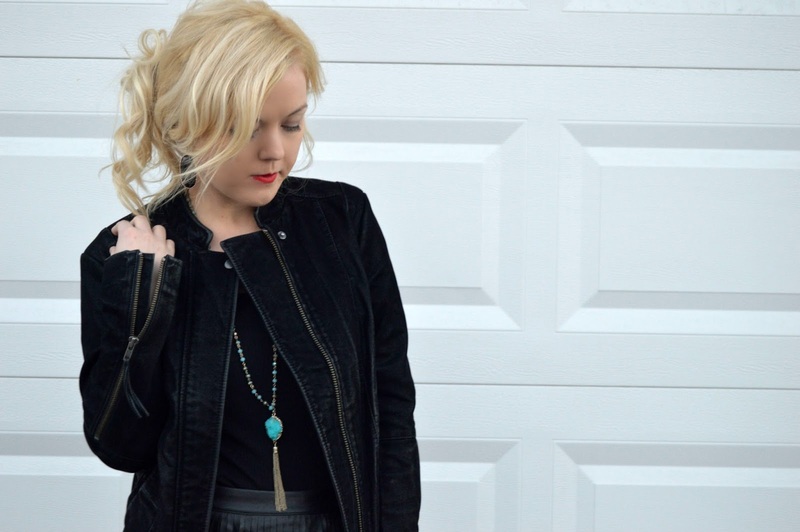 Double the Fun: Fringe & Leopard! Red lips: Bite Beauty Matte Creme Lip Crayon in Fraise (here) + Make Up For Ever Artist Plexi-Gloss in color 403-Red (here). The look I'm sharing with you today is one of my favorites for a date night, or a night out with friends! There is just something about fringe that is so sassy and fun, which translates into being perfect for the weekend, am I right!? This is a skirt I bought a couple of years ago at Dillard's and is by the CUTEST brand called Chelsea & Violet. I actually purchased it for a Kip Moore concert with my friends and it's been the perfect staple piece in my wardrobe ever since (not to mention it's great to wear while rocking out to some country music, one of my favorite past times, lol 😂). It's definitely a fabulous transition piece from winter into spring as you can pair it with a sleeveless top & throw on a leather jacket, as I did here! For an edgy look, it would be SO cute paired with Converse sneakers or OTK boots! I decided to go for a monochromatic look for my OOTN, but added color with my pop of turquoise in my necklace, red lips, and of course, the ever so timeless leopard print. I absolutely love these Sam Edelman pumps I scored at TJ Maxx & I find myself pairing them with so many things (see another way I have styled them here). Leopard print heels are another closet staple for me! Not to mention, I think they really added to the "fun" vibe of this outfit. Fringe + leopard print = a winning combination in my book! And that, ladies & gents, is my kind of mathematical equation...haha! I hope y'all have a fabulous week. Thank you SO much for reading; I appreciate each & every one of you! Be on the lookout for some fun projects coming soon to APFF!